TasteForLife.com has always offered optimum information and advice on healthy and natural living. Now they are offering FREE samples and coupons for healthy and natural products to help promote our community's motivations to live a more healthy, natural, and sustainable lifestyle. -- The best of kefir in a veggie capsule. 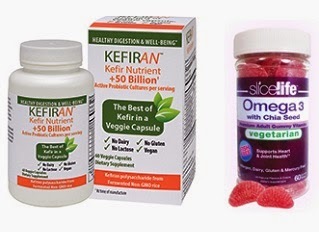 Two KEFIRAN capsules provide as much kefiran the polysaccharide as a quart of traditional kefir, plus 50 billion live cultures for digestive support. It contains no dairy, no lactose, no gluten and is vegan. Call 1-201-661-6033 for information or a FREE bottle. -- This vegetarian approved, all-natural cranberry-orange flavored adult gummy vitamin promotes healthy brain and vision function with no “fishy” taste! Enter code: BNOMEGA for a free sample. Print a $2 off coupon. -- Recommended by the American Pregnancy Association, Prenatal Oxylent® is a premium-quality, easy-to-digest daily prenatal multivitamin drink, instead of pills or tablets! $5 coupon! -- SLIMit® is the most advanced Meratrim® supplement available. It contains 100% pure Meratrim®, plus advanced slimming agents like Resveratrol, Chromium, Amla, Shilajit and Black Pepper. Save 25% with code: T4L0414. -- Not everyone absorbs CoQ10 even with advanced formulations. CoQ10-SR™ features MicroActive® CoQ10 – the only form of CoQ10 clinically shown to enhance absorption across all users. * CoQ10-SR also provides 24-hour extended release, enabling you take just 1 capsule daily. Receive 20% off your purchase.